Free website analytics can help you unlock the potential of your website, your advertising and your business. Just about every home furnishings retailer has a website these days. Some are well done, customer focused and brand appropriate. Many aren’t, but we will leave that discussion for another day. Even fewer retailers take the time and effort to track their website analytics. So why should you do this? Well, first, it’s free. No strings attached. Google has empowered anyone who wants to uncover and/or create revenue opportunities by installing Google Analytics on his or her website. Only a company with Google’s market power and incredibly smart employees would make such a useful tool available for free, but they have, and everyone of you with a website should want to use it - especially in our current economic environment. Working efficiently to maximize ROI is imperative in times like these and Google Analytics makes this much easier and less time consuming. It delivers many of the metrics you need to accurately measure the effectiveness of almost every aspect of your online and offline advertising dollars. With careful review and interpretation, you will be able to immediately make changes to your website and to other real world operational areas to bring you into closer alignment with your customers’ desires – NOW and in real time. How do you install Google Analytics on your website, and what, exactly, will it allow you to do? Now, what are the top ten ways retailers can use analytics to uncover or create revenue opportunities? 1 The executive dashboard function allows you to see all of the most critically important metrics from your website at one glance. If there is a problem area, you can immediately take action to correct it. You can see exactly what zip codes your website’s visitors are in. You can determine exactly what areas of your trading area are garnering more page views. 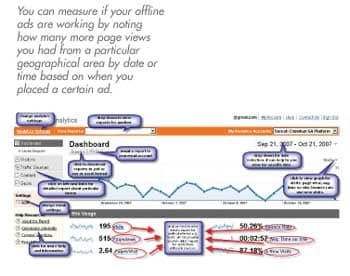 You can measure if your offline ads are working by noting how many more page views you had from a particular geographical area by date or time based on when you placed a certain ad. 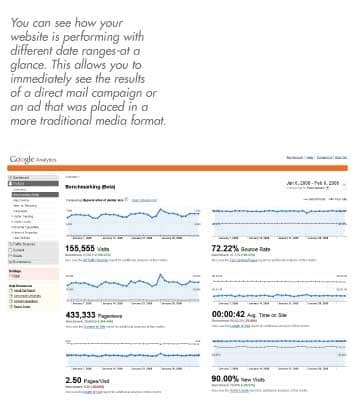 3 You can see how your website is performing with different date ranges-at a glance. This allows you to immediately see the results of a direct mail campaign or an ad that was placed in a more traditional media format. 4 If you advertise with AdWords or Ad Sense, Google Analytics will provide you with specific metrics for each campaign, group or keyword you use. You can see the number of clicks, the cost, and conversion and if it resulted in an ecommerce transaction (if you have ecommerce) or some other goal that you’ve pre-defined. Then, it will calculate your margin-revenue spent vs. the cost of acquiring the customer. 5 Site overlay allows you to see how many times each link on your site has been clicked and whether that ultimately led to conversion if you are running ecommerce. If not, you can take a look at your most clicked on links and brainstorm what is it about those links that is appealing to your visitors. Then you can replicate that information in other media. In addition, you can re-work those links that are not attracting visitors to make them more relevant. You can do this as often as you wish. 6 Analytics also allows you to set up specific reports and specify when and to whom they will automatically be sent. This makes for clear communication and huge productivity savings. 7 You will be able to see which keywords visitors are using to come to your site and their ranking. This allows you to set up targeted advertising campaigns with those keywords, send out offers to them and add relevant content to your website to bring them back for more. For instance, if the number one keyword that people are using on your site is “couch” vs. “sofa”, you can buy the ad word “couch” in order to generate more traffic. It can also alert you to bizarre keywords and unusual trends that you would never find out about otherwise. If you find out, for example, that for three months running, the top three keywords on your site are: “outdoor furniture”, “kitchen tables” and “area rugs”, you can add appropriate content to your site and also alert your buyers to the fact that consumers are looking for these product categories on your website and probably in your store as well. 8 You will be able to identify websites that people are coming from to visit your site and also view the number of visitors coming from each of these sites. You may want to consider sponsored search ads on sites that send you the most traffic. In addition, if you do ecommerce, you will be able to see how many people convert off of each referring site and so understand the relative quality of the traffic you receive. 9 You can track how many of your visitors come back to your site again and again so you know if your content and offers are relevant. If not, you can make changes to bring up your numbers. 10 Last, but not least, Google Analytics tells you what the top content is for each page on your site. You can see how many times it has been viewed and how long the average customer “sticks” to that piece of content. By looking at this daily or weekly, you can determine what content your customers find valuable. This will allow you to offer more valuable content, offers or coupons on specific pages, or stage a special store event that relates to that content. There are many more metrics that Google Analytics offers you, as well. As you explore and become familiar with this tool, you and your team will find even more creative ways to uncover and create revenue based on your particular needs. 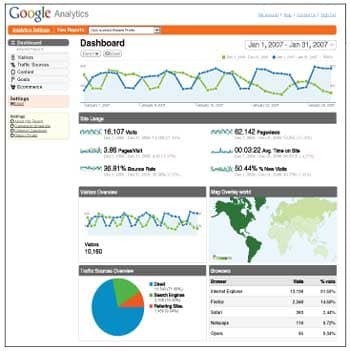 Before setting up your reports, you may also want to take a look at this excellent article, “Make Web Analytics Actionable: Focus On “What’s Changed” at www.kaushik.net/avinash. This article points out that that sifting through piles of web data can be difficult and tedious and mentions additional tools that savvy marketers can use to focus attention on changes in the web use data stream over time. These tools can help you to more quickly see which keywords are rising or falling and help you to find hidden trends in website data. For any retailer, using and taking action on the metrics available from the free Google Analytics application is a huge step forward. It can help to tightly align your buying, visual merchandising, website, marketing and advertising teams in order to attract new customers who are looking for companies that understand them, listen to them, engage with them and advertise to them with offers based on their real interests. Once your customers understand that you are authentically and consistently targeting your messages to their particular needs, your opportunity to gain market share, margins and referrals can increase exponentially. These customers, cultivated intelligently through your use of leading edge website analytics are likely to become your biggest advocates in both the real and online worlds.